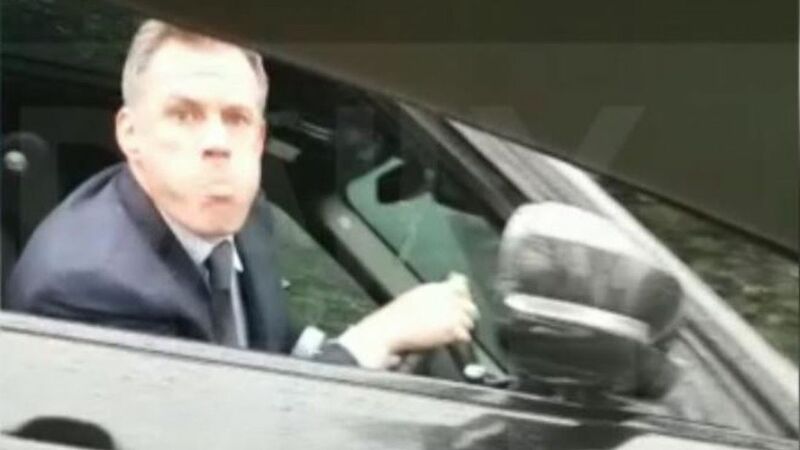 Former Liverpool and England international, Jamie Carragher, was caught on video spitting at a Manchester United fan and his 14-year-old daughter after Manchester United defeated Liverpool 2-1 at Old Trafford on Saturday 10th March. Carragher, 40, has since been suspended from his role as a pundit and commentator for Sky Sports following the embarrassing behavior. It's not stated how long the suspension will last. Carragher has been removed from Sky Sports' Monday Night Football broadcast this week as a result of the incident. He had already been culled from his duties as a pundit for Danish channel TV3 Sport on Tuesday night, where he was supposed to review Manchester United's clash with Sevilla. “He looked at me and waved, I waved back and then he put his window down." “I said, ‘Hey Jamie, good result, 2-1’ and he sort of looked at me and I said, ‘2-1, ha ha’ and his face just changed. I could just see him lurch towards his window and spit."